It’s 1995 and this is the scene in the US Patent and Trademark office (US PTO). Steve: ‘Righto. Wish I’d have invented that Vacuum Beauty Helmet eh? Bet it makes a fortune! And Naturally Occurring Human Genetic Material? Bless my soul, they do invent some amazing things these days. We’ll have a cup of tea and then we’ll get the ‘yes’ stamps out. Myriad Genetics were very pleased that they had been given several (over 20) patents for the the BRCA1 and BRCA2 genes, as this meant they were the only company in the US that could offer BRCA testing. These tests tell women whether they have a mutation in the BRCA gene, which increases lifetime breast cancer risk by up to 87%. Myriad charged $3000 for the tests, and sued any other company using the gene for testing or for research. Some other more fair minded people decided that this was all a tad outrageous, and sued both Myriad and the US PTO. 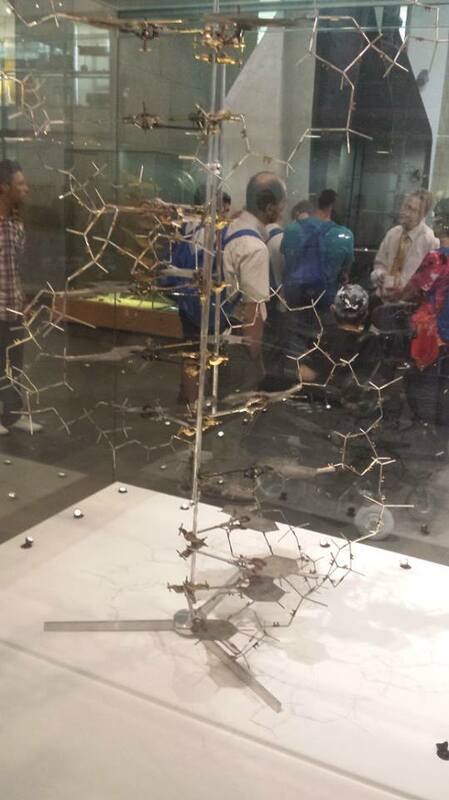 Watson and Crick’s model of DNA in the Natural History Museum, London. James D. Watson resigned from the Directorship of the National Institutes of Health in 1992, in part because he disagreed with their filing of patent applications for human gene sequences. Had Myriad been a little more generous with their patented genes, the issue may never have reached the Supreme Court. But it did, and there continued a lot of arguing about whether naturally occurring genetic material could be patented or not. Myriad argued that the word ‘gene’ is just a human construct to classify and define a portion of the gene product, therefore a human ‘gene’ is a human creation. Come on Myriad, I mean are we really going to fall for that? That’s like saying that we can patent the layers of the atmosphere just because we’ve divided it up into bits and labelled it. Then they argued that all human artifacts are all products of nature. Ashes to ashes and dust to dust. Dan Burk of the University of California (2013) points out that ‘beavers build dams, bees build hives, and humans build microchips’, so DNA, especially that DNA isolated in a lab, is of human construct. Myriad then argued that it had taken years and years of research to locate and isolate these genes. Which is probably very true, and patents have been given for ‘mental exercises’ when they have been linked to useful invention. Chakrabaty, (2012) cites the patenting of ‘the application of the Arrhenius equation to a process of the determination of optimum curing of rubber’ in 1981. Yawn. And hold on, haven’t we, as tax payers of the world, payed huge amounts of money to fund the Human Genome Project? And now we are going to let private companies profiteer on the back of that? In the end the judges of the US Supreme Court decided that naturally occurring human DNA is unpatentable, but DNA created artificially in the lab (cDNA) is patentable. And that’s because any portion of DNA separated from it’s human chromosome finds itself left with 2 free electron pairs, which bond to hydrogen atoms, which in turn causes the DNA to fold up into a different shape than it would have in it’s natural environment. It takes on an ‘unpredictable three- dimensional physical structure’, and a judge would ultimately have to decide whether the information contained in both molecules is ‘effectively the same’ (Burk 2013). This makes sense to me, because I know that my son, Finnan’s, DNA code contains a mutation on chromosome 16, which means that one of his enzymes doesn’t fold up in the way it should, which ultimately means that it’s function is severely impaired. However, there is still hot debate about how different cDNA (lab engineered) is to gDNA (native genomic DNA). How sufficient does the structural difference have to be before the DNA is said to have been ‘created’ by humans? Myriad lost their patent of BRCA1 and BRCA2 two years before their 20 year patent was about to expire. But they still have to right to their unique way of making artificial BRCA cDNA. Gostin (2013), believes that the Supreme Court’s Decision leaves plenty of room for profit making as long as entrepreneurs can prove the originality of their methods or applications. On the other hand, patents do encourage innovation and making policy that cuts away too many rights could be detrimental to progress. Cook-Deegan (2013) believes that this ruling does not threaten most patents for therapeutic proteins (like insulin), and that companies that offer whole genome analysis will be ‘breathing a sigh of relief’. All very well, but what does this mean for rare disease patients? Julia Boonnak is the mum of three little monsters, including Finnan (CDG1a). Living and teaching in her husband’s native Thailand at the moment, she plans on moving back to England in July. You can read more of her material throughhttps://cantdogymnastics.blogspot.com/. Burk, D (2013) Edifying Thoughts of a Patent Watcher: The Nature of DNA. Legal Studies Research Paper Series No. 2013-103. University of California, Ivine-School of Law. Gostin, L (2013) Who Owns Human Genes? Is DNA Patentable? https://jama.jamanetwork.com/ on 07/31/2013.